Yesterday, the long awaited day came and we have our head-to-head golf matchup for the ages. 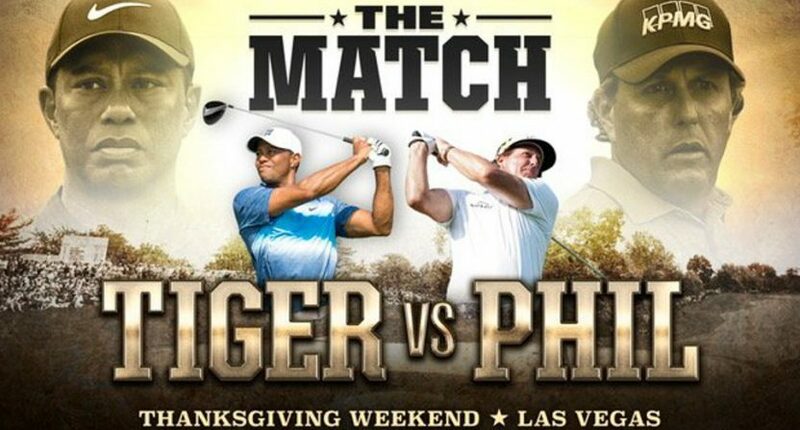 Tiger Woods vs. Phil Mickelson for $9 million Thanksgiving weekend which will be produced by Turner Sports and shown on pay-per-view via B/R Live and with DirecTV and AT&T U-Verse. When reports first surfaced, this sounded like the greatest thing ever. Despite the fact that this was happening ten years too late, it was still an event featuring two of the most popular golfers in the world and who could still go out and win on any given week. And for all we knew, these two were going to put up $5 million each and the winner at the end of the round took home all $10 million. That’s the kind of high stakes thing that would not only attract golf fans but bring in a huge mainstream audience. And chances are, the golfer who loses will make up their losses in the revenue this event would generate. Instead, we’re getting what might be one of the lamest sports events ever. Being on pay-per-view will bring in some direct revenue but it’s going to seriously hurt the viewership. Only golf fans are going to pay and tune into this. And depending on the price, some may not even do that. It just gives off a greedy vibe that ruined boxing when they went to pay-per-view decades ago even though this will be a one-time thing for golf. So the sport itself is going to be alright, unlike boxing. But what really capped off this “excitement” for me was this pathetic attempt at trash talk between Tiger’s and Phil’s Twitter accounts. Phil created his Twitter account hours the same day as the announcement so we know why he finally got on social media, but this “trash talk” is just horrible. I’m sure this smackdown will be appreciated by anyone over the age of 65 who will see those tweets three days from now but they both really need some help in how to get people interested in this event. Instead of a high stakes event where the loser loses out on $5 million, it just sounds like two friends who are going to gamble a little more money than they normally would when playing a practice round. And on top of that, it’ll be televised. The only thing I can really get behind is that they are going to have side bets throughout the event where the winner will have money donated to the charity of their choice. That’s actually pretty cool. But despite the side bets, it’s still not going to make me pay money to see this event. This would’ve been a stretch for me to tune in if it was on cable, I’m definitely not going to do it now if it’s on pay-per-view. Which is a shame because when it was first proposed, I was ready to watch and even pay whatever it cost to see this. Now, I’ll find out what happens after it’s over. I can’t really be invested in a “winner-take-all” event when I know both people are getting richer regardless of how they do.